The pond next to the Museum’s North Parking Lot may not look special, but it is especially significant. During the redesign of its parking lots, Mystic Seaport redesigned the adjoining wetlands. Opposite the main entrance, a small tidal marsh was rebuilt with plantings native to Connecticut salt marshes. This freshwater pond covers part of the site of a pasture pond in Greenmanville. It has been reshaped and replanted with native species to filter the storm water that runs off the nearby mill roof and parking lot, delivering clean water to the Mystic River. From bacteria to birds, it has become a little preserve of local nature. 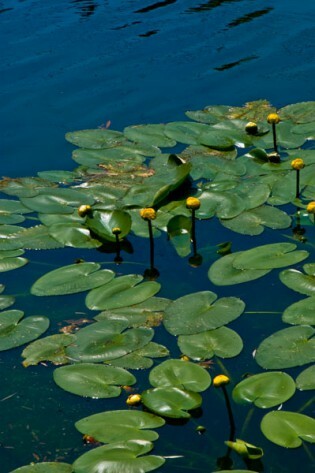 In summer you may see a “fountain” in the pond, which is an aerator to ensure that the water is well oxygenated so the pond can perform its purifying function.